DETROIT, Michigan, January 11, 2012 (ENS) – The 2012 Hyundai Elantra and the Land Rover Range Rover Evoque are the North American Car and Truck of the Year a panel of automotive journalists announced Monday. The awards came right after the opening ceremonies of one of the world’s largest and most influential auto shows – the 2012 North American International Auto Show at Cobo Center in Detroit. 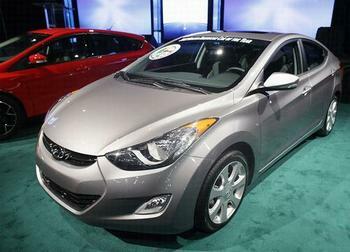 The Elantra surpassed the Ford Focus and Volkswagen Passat, the other two finalists for the car of the year award. The Evoque beat out the BMW X3 and the Honda CR-V. The finalists were named in December by the 50 independent automotive journalists from the United States and Canada who make up the North American Car of the Year voting panel. “We’re very humbled, said Hyundai Motor America chief executive John Krafcik. “The Focus is an amazing car, the Passat is incredible.” Since it was redesigned for the 2011 model year, Hyundai has sold more than 200,000 Elantras, said Krafcik. The Korean automaker manufactures the Elantra at its factory in Montgomery, Alabama. The North American Truck of the Year Range Rover Evoque is a luxury SUV with a 2.0-liter direct injection turbo four-cylinder that achieves 28 miles per gallon on the highway. Many other vehicles were honored with a shower of awards as the two Press Preview days unfolded on Monday and Tuesday. The International Car of the Year Award’s jury announced its 2012 winners on Tuesday, naming the Audi A7 as the 2012 International Car of the Year and the 2012 Range Rover Evoque as International Truck of the Year. Courtney Caldwell, editor-in-chief of Road & Travel Magazine, founded the themed awards in 1996 to recognize the strong emotional attachment people have with their cars. “The ICOTY Awards are not about power and performance but rather personality, passion and personal lifestyle,” said Caldwell, presenting this year’s awards. ICOTY jurors handed the Earth, Wind & Power Award to the Volkswagen Passat TDI as the Most Earth Friendly Car of the Year. In another set of awards, the 2012 Volkswagen Passat was named Cars.com’s “Best of 2012,” the online automotive site announced Tuesday night during its annual awards show gala. More than 1,500 auto industry executives attended the celebration at the Fillmore Detroit, which included a private performance by Grammy Award-winning band Maroon 5. Six vehicles were nominated for the Cars.com “Best of 2012” award – the 2012 Audi A7, 2012 Hyundai Accent, 2012 Hyundai Veloster, 2012 Land Rover Range Rover Evoque, 2012 Subaru Impreza and the 2012 Volkswagen Passat. The Passat TDI runs on ultra-low-sulfur diesel fuel, helping reduce sooty emissions by up to 90 percent compared to previous diesel engines, the company says. It achieves up to 43 highway miles per gallon and can travel 795 miles on a single tank of fuel. In a separate set of awards that recognize a manufacturer’s ability to retain owners over repeat buying cycles, Ford Motor Company took top honors for the second year in a row during the 16th annual Polk Automotive Loyalty Awards, presented this evening at the Automotive News World Congress in Detroit. Ford was a repeat winner in several categories, including: Overall Loyalty to Manufacturer; Overall Loyalty to Make; African-American Market Loyalty to Make; and Mid/Full-Size Pickup for its F-Series truck lineup, which has been honored in that category 14 out of the last 16 years. The Hyundai Elantra won the award for loyalty in the compact car segment, and the Ford Escape was recognized in the compact SUV category, another first time winner. “This is a true testament to Hyundai’s product success and confirmation that it has become an exciting brand in the U.S. market,” said Brad Smith, director of Polk’s Loyalty Management Practice. The North American International Auto Show welcomes industry insiders for their two preview days on Wednesday and Thursday, while Friday is a charity preview day. On Saturday, January 14, the show opens to the general public with more than 500 new cars and trucks on view.